Four lathes will again be available at Russ’s shop plus several different set-ups for sharpening turning tools. This is the second of three of these teaching sessions scheduled for this year. Come and take advantage of the one-on-one teaching. At the February 28th meeting President Jim Rinde and Past President Al Geller announced that we have located a “permanent” venue for many of the club meetings. Long time friend of the club, Levi Mize, has volunteered the use of his professional cabinet making shop for the use of the club meetings on Saturday mornings. This will be particularly useful when we hold teaching demonstrations by our own members and the professionals we are increasingly able to bring for our all-day meetings. Thank you Levi for making your shop available. 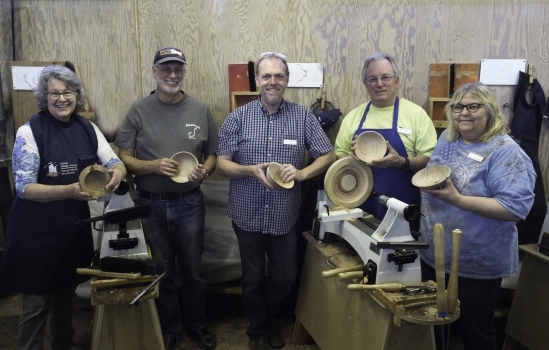 He has a long bed Vicmarc lathe with a 1 1/4″ x 8 tpi spindle that will accommodate the chucks and jigs that most of us have already use, plus he has plenty of space to accommodate the increasingly large attendance at our meetings. We will still hold some of the meetings at home shops of members when indicated. 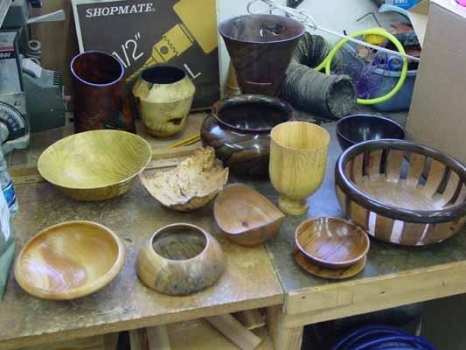 Note that this month’s meetingis at Russ Babbitt’s where we are able to set up the four lathes needed for the hands-on-sessions. We are in the process of setting up a formal Mentoring Program. 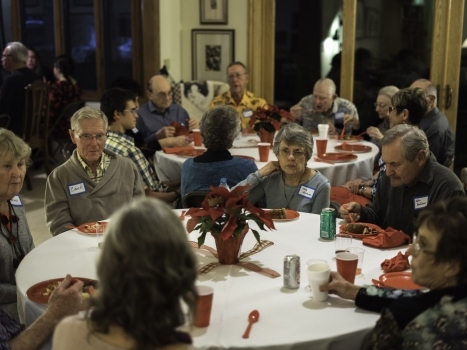 A list of names will be available at our meetings of members who are willing to spend time on a volunteer basis, listing the topics they feel comfortable teaching for one-on-one sessions at non-meeting times by mutual arrangement with other members. This is one more reason to join the club. If you haven’t already volunteered and wish to participate send your name and the topics you will teach to David Frank. Another friend of the club, Tim Albers, works for Mission Produce, Inc. Avocados are one of their main products and it is tree pruning season. He brought a pickup truck full of freshly cut avocado logs. The club has agreed to make 20-25 small wet-turned bowls for his company to give away as gifts for their customers. In return he has supplied us with an abundance of beautiful wood and will donate funds to help equip the club’s teaching tools. 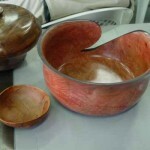 The show-n-tell session featured the thin-walled bowls that were the Challenge for the month. Some of these were paper thin in spots and others consisted of bowls in more than one piece as the turner pressed their luck to the breaking point. But that is how we learn to extend our abilities and technical skills. If we play it save all of the time we will improve only very slowly or not at all. See two photos below from the shown-n-tell table. 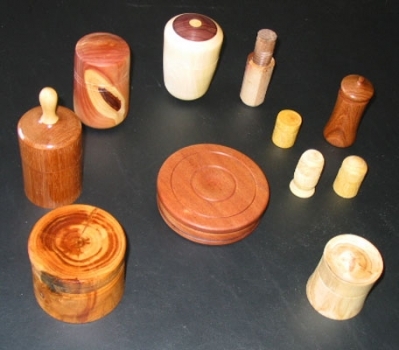 Ron Lindsay showed the set of turning tools he made from the kits for making 3/8″ Glaser turning tools and handles which are available from Pete Carta. Give Ron a call if you are interested in more information. 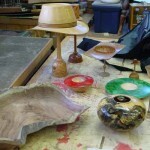 Warren Brown and Ron Lindsay have arranged for the Camarillo Library to again showcase our wood turnings in July. Bring the 3-4 pieces you want displayed to the Junemeeting and they will take care of getting the display set up by July 1. Remember that the Ventura County Fair starts on August 4th and that the date for entering work will be late July, so you won’t be able to use the same pieces as for the library. After taking a short break to unload Tim Albers truck, we began the featured all-day turning demonstration by Steve Dunn. Steve owns and runs High Figured Hardwoods at 416 W. 168th Street in Gardena, CA. 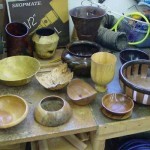 He both sells green wood and has a special shop set up for teaching woodturning classes. Steve both teaches and brings in other world class professional demonstrators. His classes are limited in size to maximize the one-on-one time his students and instructors share. He can be reached at ambkell@aol.com. As the third photo below shows, Steve is an accomplished turner. 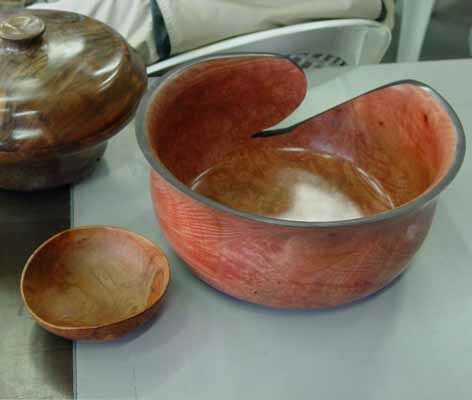 The photos from the three projects he demonstrated for us are on his Demo Page: thin-stemmed goblets; using aniline dye for coloring highly-figured light-grained wood; and turning square bowls. His demonstration of what he calls “negative rake” scraping tools for safely and easily making smooth finish cuts was new to most of our members (and you will have to ask someone who was there if you missed it!). Note that the goblet Steve turned will also be included as a door prize along with the Lyle Jameison bowl at out July 10th Picnic. The president’s challenge for March is to turn a goblet or cup. Jim says “now that Steve Dunn has showed us the special care needed to make thin-stemmed goblets we should all try and make one. Bring your successes and failures to the March 27th meeting!” See the Spring 2004 Issue Vol. 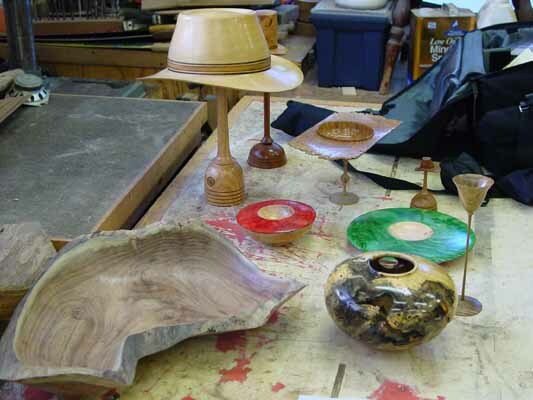 19 #1 of American Woodturner page 30 for an excellent article by Jim Rinde on the “Evolution of a Design” about his epoxy and wood creations. Congratulations Jim! More of his work can be seen in the gallery sectionhere. A sample of Steve Dunn’s work.